Protecting Your Business And Family! 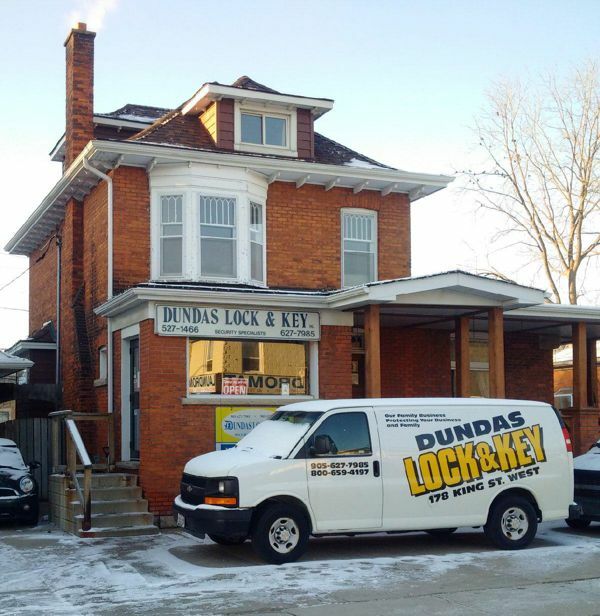 Dundas Lock & Key Inc. has served Dundas, Hamilton, Ancaster, Flamborough and surrounding area for over 35 years. We have three full time locksmiths available to provide your typical services such as cutting keys, making keys for locks that don't have a key and re-keying or repairing a lock. We are able to do lock work for Residential, Commercial, Industrial or Automotive locks and door hardware, either in shop or mobile service. We sell a wide selection of hardware e.g. deadbolts, handles, door closers, panic exit devices, etc. and offer all the top brand names including Medeco, Schlage, Emtek, LCN, Von Duprin, Yale and Sargent. Security hardware, including custom made window bars, door grills, and gates are also available for homes and business. We are an Authorized Dealer of the MEDECO High Security System which is a Restricted Keyway System that in the past was considered for Commercial or Industrial market but is now being used more and more by homeowners in order to have better key control.